As most of the ones who keep an eye out for my work, and sometimes for the actual description that goes with it, I use free open-source software to design, i.e. GIMP and Inkscape. Today I’ll focus on the latter to present my exploration trough the realm of gaining skills. As I mention in the title, today I’ll talk about about grain textures in my choice vector program, Inkscape. I call them grain textures because that is how all design sources I consulted refer to it. However, I’d be much more inclined to call it a granular gradient (it has a nice je ne sais quoi about it, doesn’t it?). Anyway, let’s get to the point. If you consider that you don’t need to know how I got to the answers, you should just scroll to My Exploration. A texture is a structure than can be seen and/or felt. The texture can consist of structure lines and/or objects. Texture exists in materials and can be created through inscription and application. So what is this magic texture I’m all hyped about? It’s, as they seemed to me in the first place, the combination of a gradient that is masked or made from these fine granular spots. The density of the grain is proportional with the lightness of the gradient. Pretty simple, huh? Let’s get to some examples! Still not really getting the gist of it? Then have some more! As you can see, things can get diverse and mind blowing! Yeah, designing is ruled by the same principles and programmers tend to be consistent between software so, yes, I am looking on how do the Adobe aficionados do it. As another designer must have hit this wall before, there should have been an inquiry about this on StackExchange’s design community. And there is. The first solution that came up was in the question itself, as the obvious one: a combination of gradient and noise effects. However, two major problems might arise: pixelization that leads to print problems and contrast issues that make the application of noise ineffective. But the approved answer describes a pretty good guide: Create a new project double in size. Apply the noise, scale back the layer and paste it into your original. Increase the contrast and gradient for best results. For me, this looked like a good plan for a limited project. However, I strive for more — I want to be able to apply this at least a dozen of times without increasing the file size too much or making too many layers. This first solution seemed unhandy. Risograph style, noisy gradients, spreckled gradients, I’ve searched it all but I couldn’t find a good, free tutorial that explains properly how to create this style in photoshop. Couldn’t agree more. Let’s see what he has to say! Second method: Photoshop manipulation of the layer — Convert the layer to grayscale, make it a bitmap and resize it. Cool for you, however, that’s still not native vector, as I am looking for. Third method: Use noise on an increased layer, size it back down and set the mode to overlay. Also, bump up the gradient contrasts. Well, that sounds fun too. Fourth method: Native filter of mezzotint. Well, can’t use that either. 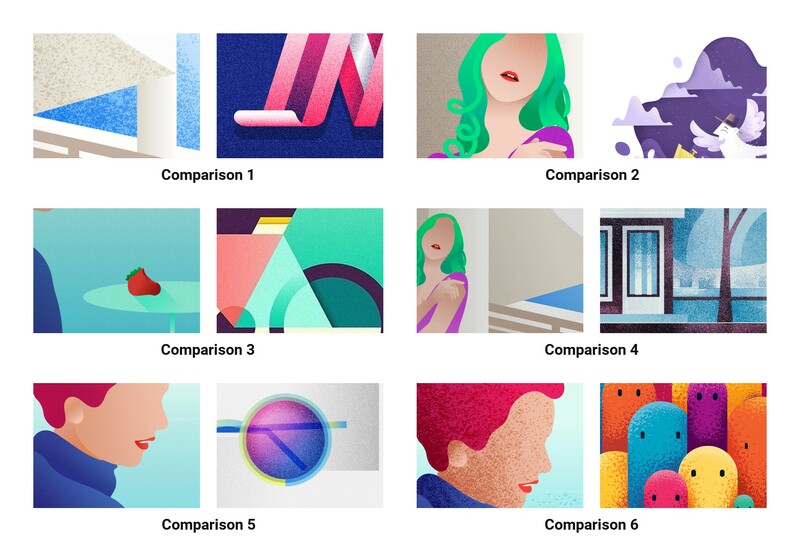 Fortunately, I stumbled upon an article from Google Design, THE team itself, written by Mat Helme. He MUST have something deep to say. Fifth method: Two additional layers with overlay and multiply as blending modes, respectively. The results are phenomenal and the detailed instructions make it a never-miss opportunity to create amazing gradients. Check out the guide yourself and as for the results, here they are. I guess I have to mention a few more tutorials. These videos are actually here for showing a video emphasis on some characteristics of what I want to achieve. Mark is a very skilled designer who, obviously, uses this noise texture as a signature to the flat style he has adopted. What interests me from his mode of work is that he uses brushes in Illustrator to create the texture. Therefore, he has all the control he wants using no more than the brush and a mask. Might give this a try. Dan does pretty much the same think but in Photoshop. To highlight the differences, he changes the brush size pretty often and puts each continuous stroke on an individual layer with the opacity as he sees fit. And here we can better see Dan using the same method for both lights and shadows — which is something pretty logical, if you take a moment to think about it. Time to share my exploration. First, let’s just get two images, trace them and add gradients to them. Then we turn it into this. Certainly, they look nice this way too (of course they do, they’re inspired by the work of a magnificent artist who’s signature style is just like this, called Cesar Santillan. After a little exploration with the noise fill settings, I reached the conclusions that the second set of parameters worked best on what I have in mind. Turn your display preferences to maximum or else you won’t be able to see your real work when working with noise unless you export. Create a noise layer above the artwork layer, switch its blend mode to multiply and lock it. Select a path on the primary layer. 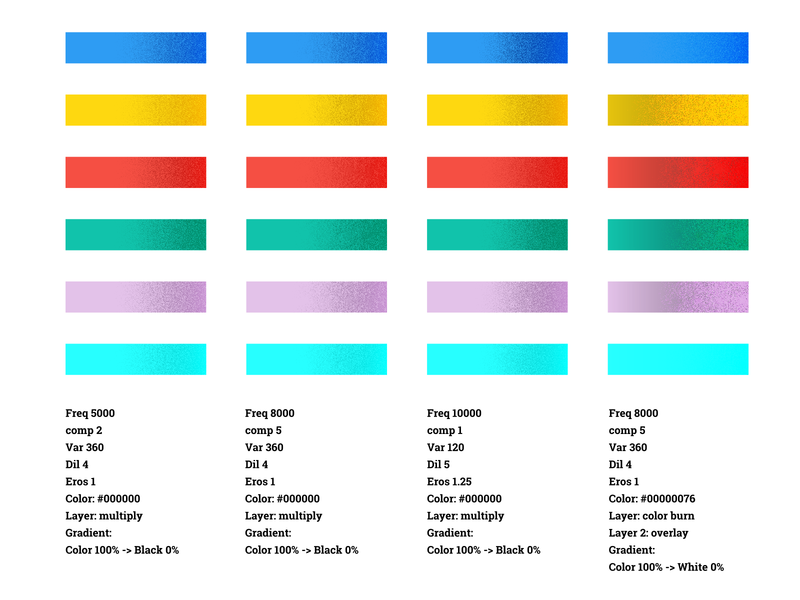 Change its fill from the original gradient to a gradient starting from the color of most importance (the deep pink in the first image hair) to #00000000 (that’s black with no opacity). Keep in mind that your grain will fade with the opacity drop. With the shape selected, go to Filters > Overlay > Noise fill and set frequency to 8000, variability to 360, dilation to 4, erosion to 1 and, most important, the color to #00000000. Apply and voilà, you start to have some grain there. Repeat for the other paths making sure they are not intersecting. You don’t want to overlay different opacity noise fills. When you’re done, duplicate the Noise layer, move it on top, change its blend mode to overlay and lower ita opacity to about 50% (or whatever makes you confortable). My results are show below. This is a genuine method, with it’s result being discrete and appealing. If you feel they are kinda dull, you can duplicate the multiply layer and test with some opacities. On a new layer above it add a rectangle the size of the artwork and color it black, full opacity. Add noise fill to it, with the same settings as in the first method. Change the layer blend mode to multiply. Duplicate the layer and change the blend mode to overlay. Lower both mask layers’ opacity to about 15%. The result will be the continous grain mask, making a sandy texture out of the whole artwork. Changing the opacities will modify the effect drastically. In some color schemes, changing the base rectangle color might do as well for some radically different results. Okay, I know that I said Inkscape in the title, and I already started talking about Illustrator, but hear me out. I had the clear definite regret that Gigantic’s grain means a lot of work and it can be done only by hand. And adding individual brush strokes in Inkscape would be hell. So that’s why I did use GIMP with a splatter brush I found on a store. You can choose whatever brush you want while the splatter is fairly simple and has a random density. Just add an overlay layer and use the drawing tool, on #000000, to create the droplet effect. If you really are looking for what Gigantic is doing, just repeat the operation on multiple layers, stacked with increasing opacity. I obviously didn’t mind to go on more than one layer. Well, I hd to put my result side-by-side with the inspiration and draw the line. Did I achieve what I wanted? Well, kind of. 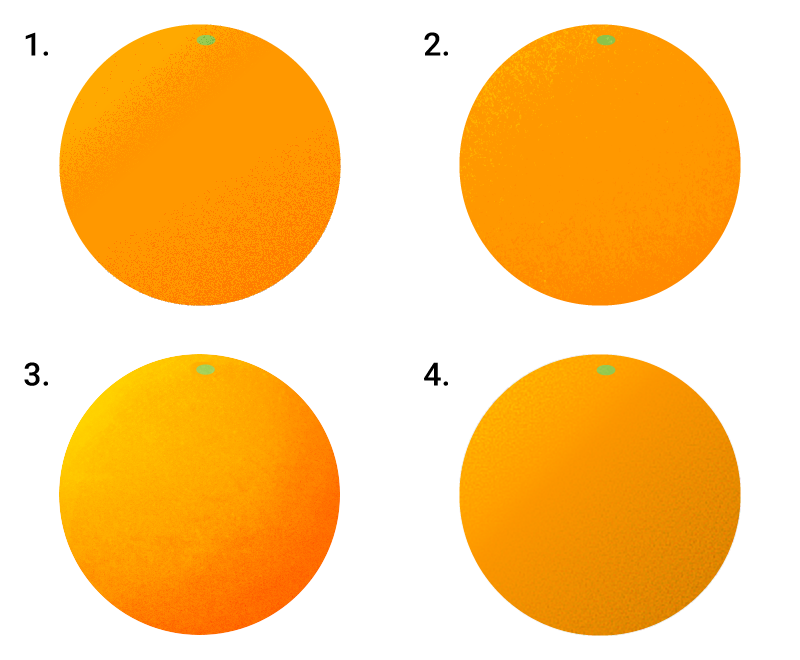 I mean, I did the continuous texture (like in comparisons 1 and 4), the discrete look (comparisons 2 and 3), the pleasant effect (comparison 5) and the spotty look (comparison 6), but something was missing… Oh, I know what it is, a tool to fasten the process. Maybe one day I’ll create a script or an extension for this function, the project being open-sourced and all. This design challenge, as I originally named it, turned out to be quite exciting and at the same time, difficult. The answer not being unique, all that I can conclude is that the technique matters much less than the process of an individual art piece or the result itself. Well, be prepaired to see grain gradients more often in my work from now on (and to actuall see some work in February). If you like this, might as well leave a round of applause.